Would you like... to be a farmer? Would you like to grow gold for your accounts? Would you like to pump game characters as it is convenient for you? Would you like to grow different accounts? Would you like to save your time? Would you like... a Personal FarmStudio? What is the Personal FarmStudio? This is a service that manages your gamе accounts, your bot and the game on your PC. 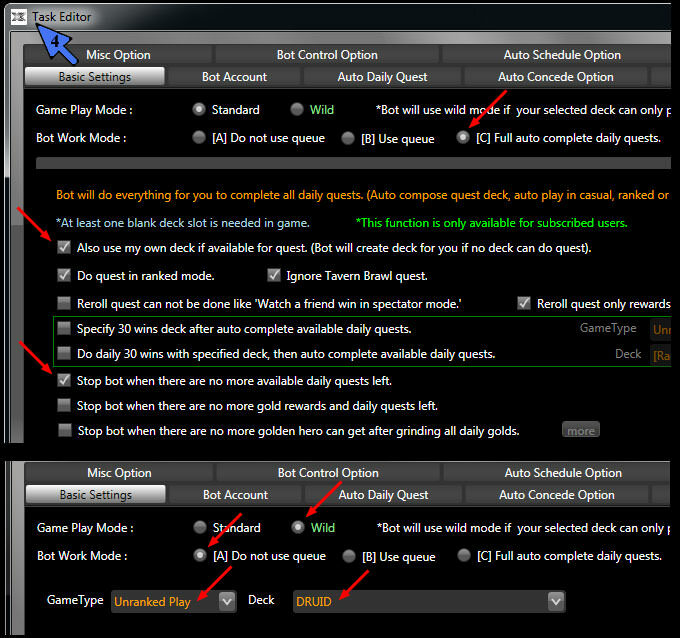 The usage scenarios can be completely different for different players (thanks to the use of profiles). 1) I want to pump my mage for 3 hours per day in the Standard mode, Ranked. 2) I want to pump my druid for 3 hours per day in the Wild mode, Casual. 3) I want play Arena about 1 hour. 4) After that I want complete the quests if they are still there. 1. Download the Personal FarmStudio client and run it. 2. Figure out your password and don't show it to anyone. It is used to encrypt game's accounts info. 3. An empty program window will be opened. Click + and add your first game account. 4. Enter the info that you need to start the game and click save. 1. To save and apply the modifications on the server click the Save button. 2. I have added 3 same account but with different names to better understand their purpose. Also I've set the right time for the pumping. 3. Press the Start button. Now you can go to sleep or leave the house - Personal FarmStudio will do all the job automatically. 1. I open the folder "YourBotFolder\task" and delete all the files. Here I am instructing the bot to use my char Mage in Ranked, Standard. Click Save. 3. 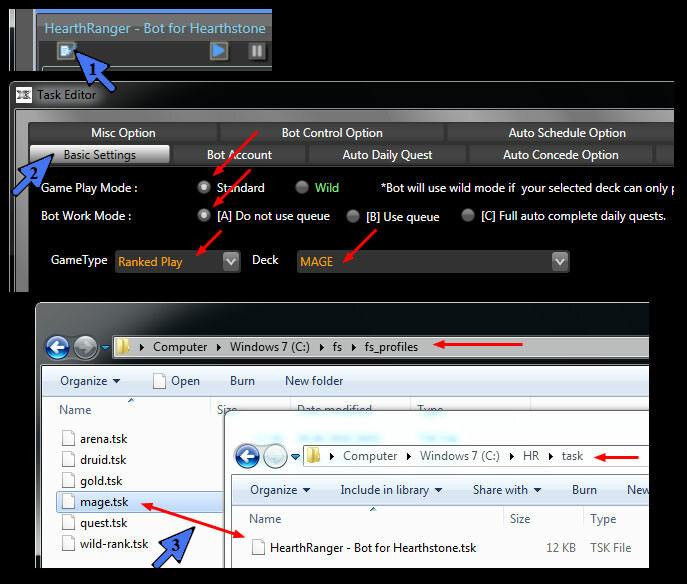 Go to the "YourBotFolder\task", rename the "HearthRanger - Bot for Hearthstone.tsk" file to mage.tsk, cut it out and paste it into the "MyFarmStudioFolder\fs_profiles"
4. I repeat steps 1-3 to create a profile for Druid, Arena and Quests. 5. To gain access to the Profiles-button you need to change View to 2. 6. Click the right mouse on the profile column and select the desired profile. 7.Click start. 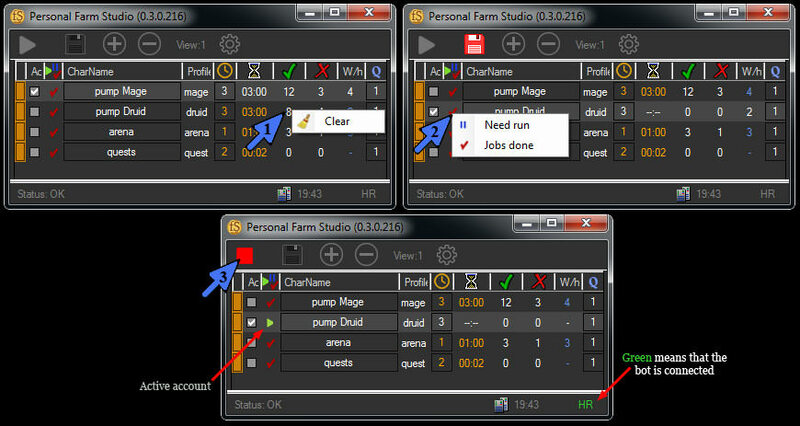 The FarmStudio will load the required profile, load the game and the bot and will monitor the execution of the tasks. According to my settings, the bot will play 7 hours (3 + 3 + 1) pumping my mage, druid and arena. I took 2 hours to complete the quests. But this profile rans only 2 minutes. What happened? Before the game I had 3 quests. 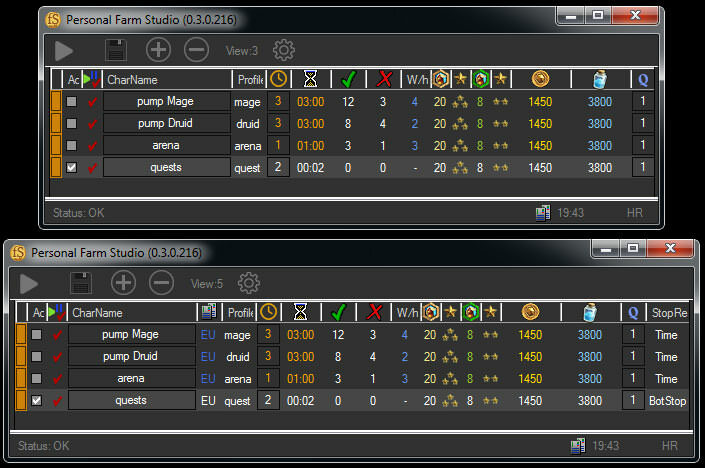 -In the process of pumping the heros and the arena 2 quests were automatically executed (1 victory by the mage and inflict X damage to the opponent's hero). Only one quest remained unfulfilled. Hold the mouse over this button (1) to read its description. -FarmStudio had run this profile, the bot started the game and reported that all available quests are completed and stopped the game (Watch a friend can't be completed by the bot) . That is what I have set in the "quest"-profile.. Therefore it took 2 minutes to complete this profile. You can change the View to get access to various options. Here you can see different Views - from compact to full, which shows even what you may not know :) (but I don't recommend full view for everyday use). You can choose to use the most convenient view. 1. If you want re-run this acc, you can clear the time info and/or clear the win-loss record. 2. You can force add this account to rotation or set that all jobs was done. 3. After changes you have to save the result and press start. You can use scheduler for different accounts. 1.Scheduled accounts only work at the scheduled time. 2.Accounts without a schedule (with duration) work at any time. 3.The schedule has the highest priority. If the account with schedule should work for example 6 hours, but you created such a profile according to which it did the work for 1h 40min, and you have other accounts WITHOUT schedule - then these accounts will be rotated in these remaining 4h 20min. Account newAcc1 should run 8h on schedule, and its profile indicates stop working after 30 wins. If it makes 30 wins for 5 hours, then the arena will work 3 hours. Also there is an account quest, which should work 3h. But if the bot executes quests faster, then we will have free time, which will be able to use the account arena, but no more then 3h because it has duration = 3h. There is nothing easier than to transfer accounts to another PC. 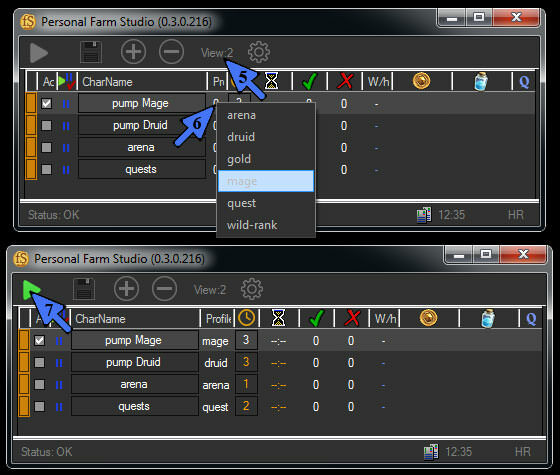 Just run the Personal FarmStudio on another PC, go to the Settings-tab, enter your Client pass and click the "Save client's password" button (1). The security of your game accounts is provided by combain of different ways. But the most inportant way you create personally - this is the password you enter when you first start the program. It is not transferred to the server and exists only in you mind. With its help, all your data is encrypted on your PC, and they are transferred to the server in an already encrypted form. So even if this data is intercepted on the way, it means absolutely nothing. Your logins, passwords, btag, names of characters are not physically accessible. Without your personal passwords, server data is just a set of characters. So you can be quiet about the security of your accounts - but don't tell this info to others and don't write it to the forums. If you want to be a beta tester - pm me. 9 users thanked Lazy cat for this useful post. Basically, this is account manager and scheduler for HR, yea? 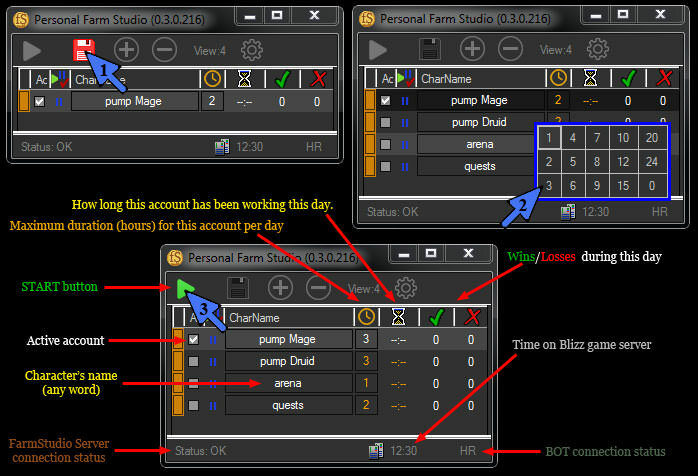 Personal FarmStudio is designed to work 24/7, so it does not have a scheduler. But I'm going to add it in the nearest future. 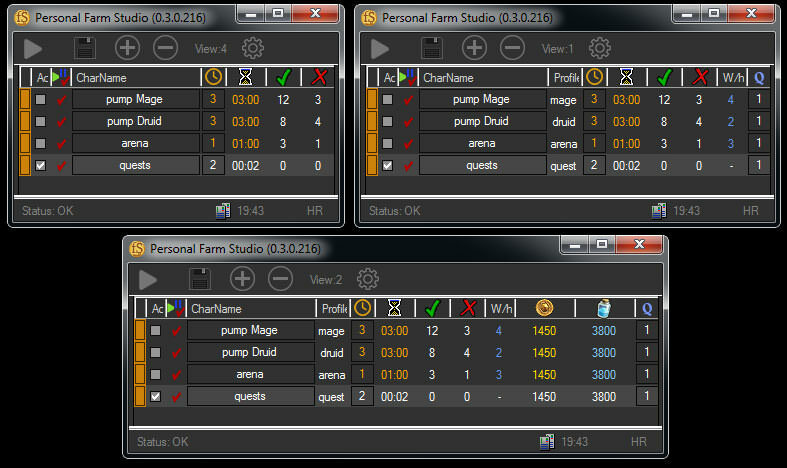 FarmStudio more like a task manager for accounts/game/bot. You can use it for multifaceted pumping of one account, and for growing a lot of "friends" or for other tasks. Don't know if this is possible with this addon but I am playing on two servers (EU and US) with two different battle.net accounts. Would like to switch to the next account after all gold rewards or 12 hours running time (both unranked). But it looks not easy to setup compared to Accountswitcher on SmartBot. 1 user thanked Lazy cat for this useful post. That scheduler stuff looks awesome! Are you willing to start giving copies of the program to test it? Great job once again. Any chance you share it with us? I would love to help testing it. I am a Chinese player and have used the hb login. This program is great. I am very supportive and thank you! Does anyone have this or anything similar? I know this is an old post and all just looking for something thanks guys. I hope so too. I have a super basic script in autohotkey that logs in and out of a bunch of different accounts but the problem is I just never know when they're done with the gold. Sometimes they are, sometimes they aren't So would love to have something like this. Can we have this functionality plz. where can i download this farmer? i cant see a download link? 1 user thanked LJstc for this useful post. This page was generated in 1.117 seconds.